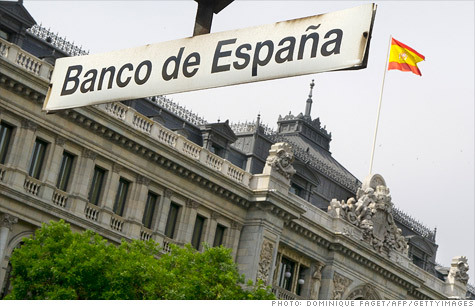 Spain's banking system is healthy, but some banks are vulnerable, the IMF says. NEW YORK (CNNMoney) -- Spain has asked the European Union for up to €100 billion ($125 billion) to provide a capital buffer for the nation's ailing banks, the Eurogroup said Saturday. "The Eurogroup has been informed that the Spanish authorities will present a formal request shortly and is willing to respond favorably to such a request," the group said in a statement. Without specifying the amount sought, Spain's economy minister, Luis de Guindos, announced the request at a news conference in Madrid. de Guindos said that the amount sought would be enough to guarantee the safety of the banks and signify credibility to the capital markets. The announcement came in the wake of an International Monetary Fund report issued late Friday saying that several banks in Spain would need to raise capital buffers by a total of €40 billion ($50.1 billion) to withstand another financial shock. EU officials are eager to resolve the issue before a pivotal election in Greece on June 17, which could present another major turning point in the long-running European debt crisis. Many details remain to be finalized, de Guindos said in Saturday's news conference. He said much will depend on the outcome of two independent audits of Spanish banks that are expected to be done later this month. The Eurogroup said in its statement that its aid would be scaled according to the results of the audit. The money will be loaned to Spain's bailout fund, which will then inject it into banks that need to raise capital, according to de Guindos. The loan will be provided on "very favorable terms," he said, adding that the conditions will only apply to banks and not the government. He stressed that Spain has asked for help with its banks, and that it has not requested a full-blown bailout. The European Financial Stability Facility could provide some of the capital, said de Guindos. But he added that the bailout fund has not been authorized by all euro area parliaments to grant such a request. The EFSF has already backed loans for Greece, Ireland and Portugal. It has about €200 billion in available funds, according to some estimates. The goal is to help the Spanish economy recover by recapitalizing insolvent banks so that those institutions can begin lending to companies and families, said de Guindos. "We believe this announcement is good news for the Spanish economy and good news for the eurozone," said de Guindos. "It shows the political willingness of the EU to eliminate the doubts that exist now about the euro." The Obama administration, hoping to keep the European crisis from fouling the U.S. economy in an election year, reacted positively to the announcement. "We welcome Spain's action to recapitalize its banking system and the commitment by its European partners to provide support," Treasury Secretary Tim Geithner said in a statement. "These are important for the health of Spain's economy and as concrete steps on the path to financial union, which is vital to the resilience of the euro area. The IMF said it subjected Spanish banks to a stress test and found that most large banks are relatively healthy. But the group warned that "several" banks would need to raise buffers under the worst-case scenario. The €40 billion figure is not a definitive estimate of the banks' capital needs. The IMF said banks would need to raise more capital depending on restructuring costs and loan adjustments that have yet to take place. "Going forward, it will be critical to communicate clearly the strategy for providing a credible backstop for capital shortfalls -- a backstop that experience shows it is better to overestimate than underestimate," said Ceyla Pazarbasioglu, deputy director of the IMF's monetary and capital markets department. Fitch ratings agency, which slashed Spain's credit rating Thursday, estimated that recapitalizing the Spanish banking sector could cost up to €100 billion. The report was released as IMF managing director Christine Lagarde called on global policy makers to come together for the sake of the global economy and "get the job done." "There is no mistaking that global risks are on the rise again," she said in a Friday speech in New York. "The euro area crisis continues to be the most immediate and most pressing threat, and there is the risk that conditions could get worse." While the euro crisis is the most immediate concern, she also warned that the U.S. economy could fall of a "fiscal cliff" if the nation's debt is not put on a sustainable path. "European banks are at the epicenter of our current worries and naturally should be the priority for repair," she said. "But this does not mean we should overlook the broader implications of today's interconnected world." Lagarde pointed to the recent disclosure by JPMorgan Chase (JPM, Fortune 500) that the largest U.S. bank by assets had lost at lest $2 billion on risky trades. "There are still many questions surrounding JPMorgan's trading loss. Yet, they should be seen as a warning shot over the bow," she said. "It reveals that too much risk remains."